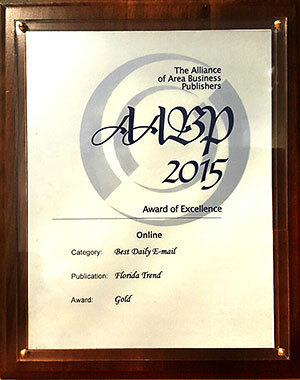 The Alliance of Area Business Publishers announced the 2015 Editorial Excellence award winners for leading business publications. The quirky opening illustration is well executed and sets a great tone for the story. The typographic effect of letters falling like dominos is terrific. The visual motif carries through the multipage layout, making the whole thing cohesive and consistent. The design makes a lot of disparate information highly readable. Judges like the strong covers, including “On Location” and “How Much Gambling?” Both are storytelling and executed well. The Florida Polytechnic University image is graphic and sized well to show off the design. Florida excels at photographic portraiture. It’s a heavy-weight fight for the championship of Florida’s grocery market. In one corner, the defending state champ, Publix. In the other, the contender and national champion, Walmart. This is an important business story, relevant to business insiders and consumers, told in the appropriate boxing metaphor. Vogel digs deeply into his subjects: for example, the largest bombing and gunnery range east of the Mississippi, the digital revolution in schools and grocery store wars, and digital divide in Florida’s schools. He builds the tension in his stories, enticing readers to keep reading and wondering: What’s going to happen next? When this newsletter hits your inbox, you’ll know you’re reading Florida Trend. It looks, feels and reads just like the main site – right down to the “Who said it” teaser. The headlines, story summaries and interactive features create an engaging experience for the subscriber. The annual competition recognizes excellence in journalism, photography and design achieved by regional business publications. Twenty-four judges are comprised of faculty members from the University of Missouri School of Journalism, with qualifications in respective area of expertise. “The purpose of the Alliance competition is to encourage a high level of journalistic performance and service to communities by recognizing editorial excellence and outstanding visual presentation in regional business publications,” said Alliance Executive Director C. James Dowden. Headquartered in Los Angeles, the Alliance of Area Business Publishers is a nonprofit national organization representing 64 independent magazine and newspaper members in the United States, Canada and Australia. For more information about the Alliance, call 310/379-8261 or visit www.bizpubs.org.